HAMPTON, Va. (Jan. 28, 2019) - Hampton University Director of Athletics Eugene Marshall, Jr. was appointed today as a member of the NCAA Division I Football Championship Subdivision (FCS) Selection Committee. 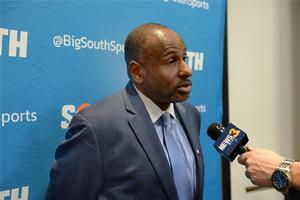 "I want to thank Big South Conference Commissioner Kyle Kallander for nominating me for this role, also thankful Hampton University President Dr. William R. Harvey for his continuing support in this appointment," said Marshall. "This shows that Hampton University is well thought of not only in the Big South Conference, but nationally. It will be an honor to represent the Big South Conference in this role." The FCS Selection committee consists of 10 athletics directors from the FCS conferences that have automatic qualification status to the football playoffs and is unique as it is the only national committee that is 100 percent comprised of athletic directors. The committee will select 24 teams to play for the championship, with 14 of those receiving at-large slots. His term is slated to end in August of 2022.